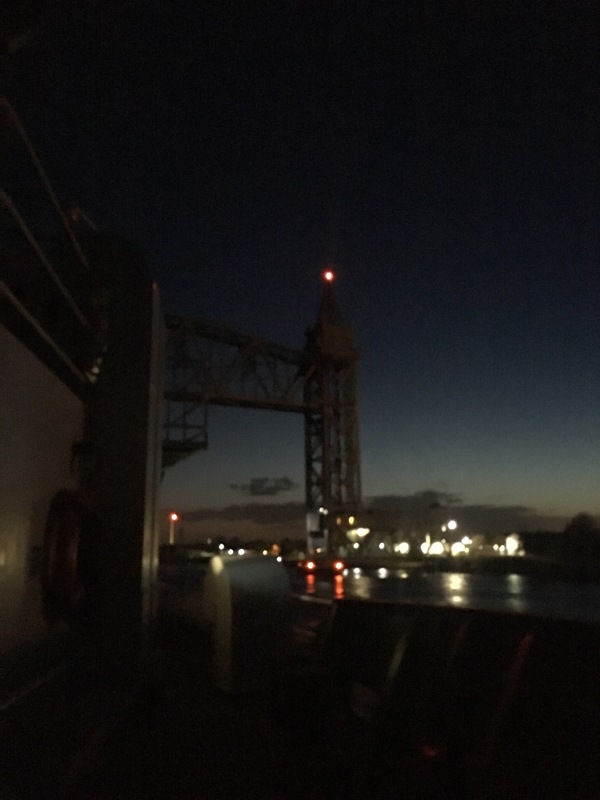 Last night we passed through the Cape Cod Canal. It was exciting to go under the bridges I have traveled over many years for a summer vacation. It was a clear night with plenty of stars shining. We collected our first haul to survey just after arriving in the bay. I was surprised by the variety of fish that we sorted, weighed, measured and took samples. The scientists I am working with are a very dedicated, professional, hard working and friendly bunch. By the time we finished it was midnight and I was done with my day assignment. I awoke to a view of Provincetown at the tip of Cape Cod in the distance. About two dozen right whales were spotted in the area. Later, I was able to observe the nets being lowered into the sea. The instruments placed along the opening of the net will measure the depth and opening area of the net. The nets are in the water for 20 minutes. The catch also included skates, lots of red hake, a few cod, lobsters of all sizes, a few star fish, alewife, mackerel and others I hope to learn more about. Sorting is done along a conveyor, 6 of us each at our stations. In my wet weather gear and rubber gloves, I place the fish in an array of buckets and baskets. I never would have imagined me holding a handful of small octopi! There must’ve been 8-10 of them! Missed the bucket! An octopus lands on my sleeve! Once the full catch is sorted, I assist alongside scientist Christine by recording the data she is collecting into the computer. We work with one species at a time, then onto the next basket or bucket. Filing tray of the Otolith Specimens Note the various names of the fish. “Once the ages are known for a sample of fish, scientists can measure the rates of various processes affecting these fish. For instance, data on fish size can be combined with age information to provide growth rates. Also, the decrease in abundance from one year (age) to the next gives a measure of mortality rates (due to the combination of fishing and natural causes). Finally, age data can be used to determine how long it takes individuals of a species to mature. Any of these vital rates may change over time, so it is important to examine age samples regularly. How did I hear about the Teacher At Sea Program? Last summer, I was fortunate to attend the Maury Project, a summer teacher development program of the American Meteotological Society held at the Naval Academy in Annapolis, MD. A few other teachers in attendance had been Teachers at Sea and sang its praises. Teachers inspiring other teachers! The Maury Project mentioned above is named for Matthew Fontaine Maury (1806- 1873) the Father of Oceanography and the NOAA ship I am aboard is the Henry B. Bigelow (1879-1987) named for the Modern Father of Oceanography. 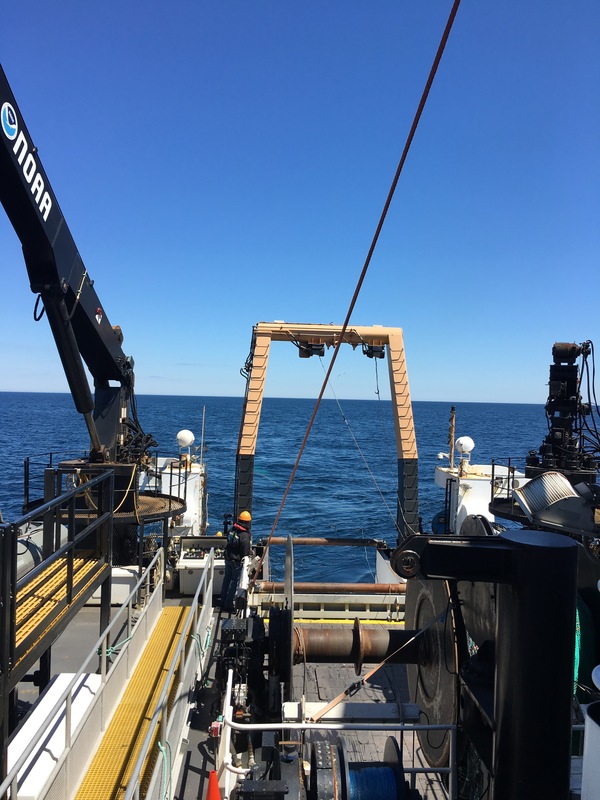 This entry was posted in 2017, Cecelia Carroll, NOAA Teacher at Sea and tagged Cape Cod, Henry B. Bigelow, NOAA ship Bigelow, spring bottom trawl survey, trawl. Bookmark the permalink.